Upcoming mixed-use building located in the heart of Quincy Center steps from the MBTA Red Line. Nova Residences of Quincy will feature 171 apartment residences and over 15,000 square feet of ground-floor commercial space. 36 second-floor apartments at Nova Residences of Quincy will be convertible to hotel rooms should market demand arise. The public galleria that will connect Hancock Street and the upcoming Quincy Center parking garage is beginning to take shape as part of the Nova Residences Quincy. The four-season galleria will feature public art, seating areas, and retail space. Nova Quincy will feature a total of 171 apartments, 36 on the second floor are convertible to hotel rooms should the market demand. The project also includes over 15,000 square feet of commercial space on the building’s ground floor that will help further activate this area of Quincy Center. The modular boxes that make up the top five floors of the Nova Residences in Quincy are now in place. The project will bring another 171 new apartments to Quincy Center. The building will also feature around 15,000 square feet of ground-floor retail space, activating a previously vacant retail section along Hancock Street. 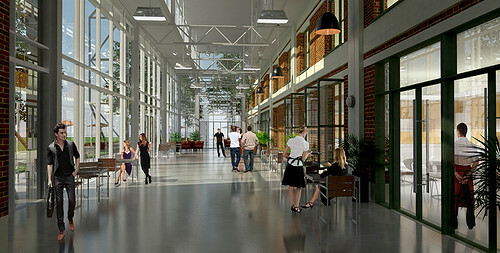 As part of the development, a public galleria will be created to connect Hancock Street to the now under construction parking garage the city is building. The Nova Residences are set to open this summer. Modular boxes have arrived and stacking has commenced for the Nova Residences at the heart of Quincy Center. The new development will feature 171 residential units and around 15,000 sq. ft. of ground-floor retail space. Units will range in size from studios to 2 bedrooms. Residents will have easy access to the MBTA Redline along with Quincy Center's new public green and myriad shopping and dining options. The interior core is in place for the upcoming 171 unit project, Nova Residences, in Quincy Center. Modular boxes will be arriving soon to complete the upper floors of the project. The development will also feature 15,000sf of commercial space and will be connected to a public, 4 season galleria linking Hancock Street to a new 650-to-700-space parking garage that will be built by the City of Quincy. The Galleria will include seating, public art, and retail. The Nova Residences are set to be open in Summer 2019. Construction continues in the heart of Quincy Center for the upcoming Nova Residences. The project will feature modular box design, with boxes set to arrive in October, according to Jonathan Miller, VP of Development and Acquisitions at LBC Boston. The 171 unit project will also feature 15,000 sf commercial space and is expected to be complete in July 2019. The foundation of Nova Residences at Quincy, a 171-unit apartment development with over 15,000 square feet of ground-floor commercial space located in burgeoning Quincy Center, is now being constructed. The project site has been graded, and concrete is being poured in order to construct the foundation's deep footings. In the coming months, vertical construction of the seven-story building will begin. A groundbreaking ceremony was held today for Nova Residences of Quincy, a 171-unit apartment development with over 15,000 square feet of ground-floor commercial space located in the heart of Quincy Center. Previously proposed as a 171-room hotel, the 153,000-square-foot building, located at 1500 Hancock Street, is expected to open in 2019 and will include 36 second-floor apartments that could be converted into hotel rooms should demand arise. Developer LBC Partners proposes to construct a 171-room hotel in the heart of Quincy Center at 1500 Hancock Street. The hotel is now under review by the City of Quincy and would be built on the site of an existing vacant retail strip owned by LBC and a portion of an adjacent city-owned parking lot, the same lot on which the 15-story Chestnut Place tower is proposed. The city is considering a land swap agreement in which the city would provide LBC with 10,196 square feet of the lot in exchange for a 2,535 square foot strip of land located in front of the existing retail buildings and 3,122 square feet of land behind the buildings. Per the agreement, LBC would also have the option to construct residential apartments at 1500 Hancock Street instead of a hotel.